One of the challenges for journalism is to represent a very multi-cultural and diverse world. Can it do it by having more diverse people in it? Has the influx of women into journalism, for example, made the news media any better at covering gender-related stories? As part of the series of Polis Media Dialogues looking at Identity, Time Magazine’s Catherine Mayer came into talk. This is the view of the event from one LSE student, Danielle Blumen. Catherine Mayer is an inspiration. The London Bureau Chief for Time magazine succeeded at simultaneously commenting on the challenges and problems the media industry is currently facing, while addressing the role of women in this constantly changing environment. She spoke about the changes going on amidst a “background of complete turmoil in traditional media” and an industry that is in flux. “People don’t trust the media very much anymore” she said. One can’t help but wonder if the introduction of more female journalists could help to alleviate this problem. A friend of Mayer once commented that women are slightly better than men at not being “shrink-wrapped turkeys” – that is, better able at getting under the skin of the community they are reporting on. She recalled her recent trip to Basra where she and a photographer were able to talk to women in a way no man could. When questioned on why she thought this happened, her response was simple – women are better at listening. She balanced this by acknowledging that women generally do have more of a burden in trying to balance their professional and private lives. Due to the recent economic environment with more people losing their jobs, women are finding it more difficult to put in the extended hours required at work if it means sacrificing their private lives. Mayer started her career at The Economist in the 1980s, in a historically male dominated industry. She was there for the switch from typewriters to computers, and as the percentage of women slowly increased. Now, as the industry is going into a complete digital age, she says she is not opposed to new media, as an opposition is silly. Many audience members commented privately on Mayer’s easy-going manner and her unexpected appearance – instead of a severe Margaret Thatcher, Mayer is an attractive young-looking woman with black hair and a black suit, apparently not fitting the stereotype most were expecting. 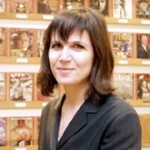 It is obvious that the media industry needs more women like Catherine Mayer. She finds it tedious to be one of the few who are always asked to come and talk about women in the media. After listening to her speak, one could hardly leave the theatre without wondering what stories and perspectives have been overlooked since there have not been a great deal of female journalists in the field – ones who do take the dangerous assignments and tough stories. Does the feminization of the media industry lead to a feminization of the issues covered? “No, not directly” she said. But then again, is this such a bad thing? This report by Polis intern Danielle Blumen. This is a great profile piece on Catherine Mayer of TIME. Really well done. Impressive journalist and very well-written article. I love it. Thank you! I agree with mayer, you cannot have everything for free. Why is there such a resistance to this idea that content can’t charge: we pay for our overpriced but pretty macs, we pay for a broadband connection, but not what comes out of those two products. I hope smart people like Ms. Mayer and others will figure this out soon. Danielle Blumen has written a thoughtful and thought-provoking piece on the role of women in the rapidly changing field of journalism. I am hopeful that feminization of content might simply translate into a broader perspective on any material that is presented. I am also hopeful that we will be reading more from Danielle Blumen in the future! Catherine Mayer is an excellent journalist, and if I’m allowed to say this, a very beautiful woman also.